Today, August 26th, marks a major milestone for us – our 10 year anniversary! 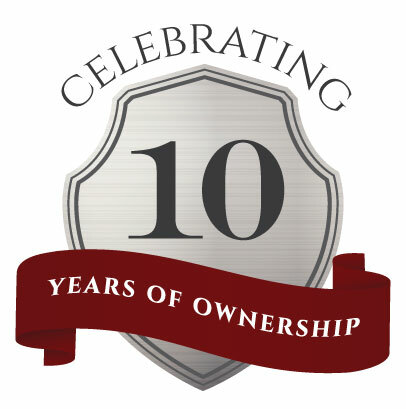 On August 26, 2005 we purchased the Hampshire Pewter company. At the time, the brand had been in existence for 31 years and the business had changed hands at least five times before us. Since its inception in 1974, and through various owners along the way, the Hampshire Pewter name has remained synonymous with fine quality and craftsmanship, a tradition and reputation we knew we could build upon. When we acquired the business, it was located in Wolfeboro, NH and we were living in Somersworth, NH. We spent eight years juggling our family and professional interests in Somersworth, with travel to the Wolfeboro store. In 2013, we made the decision to relocate the manufacturing operation and open a second retail location at Barclay Square on Route 108 in our hometown of Somersworth. Not only was it a solid business decision that would allow us more time to dedicate to the business, but with five children and strong ties to the Somersworth community, the move also made practical sense for our family. Over the years, our growing five children have become an integral part of the business. These days, we are both happily working full-time together at the Somersworth flagship store and overseeing the Wolfeboro satellite location, which remains open, thanks to our reliable and dedicated staff there. The Hampshire Pewter retail product line of ornaments and hollowware continues to grow and is available, not only in our brick and mortar locations, but also through our online store. Select Hampshire Pewter products are also made available via our wholesale channel in gift shops like Alie Jewelers in Portsmouth and Dover NH, Amidon Jewelers in Claremont, NH Boston Pewter Company at Faneuil Hall Marketplace in Boston, MA, Capitol Craftsman in Concord NH, Silver Gallery in Waynesboro, VA, Zeb’s General Store in N Conway, NH and many more across the country. We are also now offering a limited line from our company store on Amazon.com. In addition, we are often commissioned to create custom ornaments or commemorative medallions for museums and municipalities. We enjoy being a part of the Wolfeboro and Somersworth business communities and remain grateful to our loyal customers, wholesale partners and other supporters. Here’s to continued success and a bright future! Thank you all for a wonderful first 10 years! With retail locations at 9 Railroad Avenue in Wolfeboro, NH and 350 Route 108 at Barclay Square in Somersworth, NH, Hampshire Pewter is a manufacturer of fine pewter gifts and ornaments, all made from our lead-free, specialized Queen’s Metal formula. We still handcraft each and every piece with the same care as our New England ancestors. As the only pewter company in the United States to utilize the centuries-old hand-casting method to create our pewter products, Hamsphire Pewter is also a prime source of diplomatic and protocol gifts for officers of the United States Government. As strong members of the community, Harold is a member of the Planning Board for the City of Somersworth and is also an Associate Pastor and Elder for Tri-City Covenant Church. Kathy is Quality Assurance Director for Tri-City Christian Academy and a board member of the Greater Somersworth Chamber of Commerce. Harold and Kathy treasure time with their children and also enjoy spending time with friends and business associates.